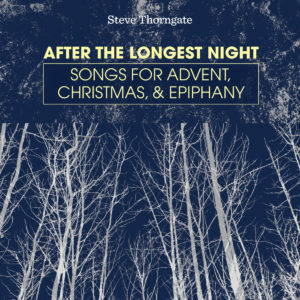 A new music collection from ACP member Steve Thorngate breathes fresh life into songs meant for use in congregational settings during Advent, Christmas and Epiphany. “After the Longest Night” is the freshman release from Thorngate, online editor for Christian Century Magazine and a church musician based in Chicago. With help from friends and family – five of eight credited musicians carry the Thorngate surname – the 14 songs on this album and in the accompanying songbook represent a modern take on Christmas music. A nod to the traditional hymn “What Child is This” belies the other thirteen new or adapted songs arranged with mostly upbeat sing a long and folk arrangements. Liberal use of the banjo, honky-tonk piano, layered guitars and jazz percussion, along with a smattering of accordion, mandolin and fiddle in the more complex arrangements, is reminiscent of a less psychedelic Sufjan Stevens. Instrumental and rich vocal harmonies add to the musical quality that displays the talent of Thorngate and his players while providing a template for use in congregational settings via the accompanying songbook.